Who is Rav Yuval Cherlo? He speaks English. He is a Posek of note from the centrist camp, who writes Tshuvos. He is a Rosh Yeshivah in Petach Tikvah. He was a founder of the moderate Tzohar. He served in the army and attended Har Etzyon. He is considered a sound moderate religious Zionist who sits in the centre and is widely respected. He is inclusive but maintains strict fidelity to authentic Halacha. During the controversy between the politically puppeteered Chief Rabbinate about extending the tenure of Rabbi Riskin of Efrat (see here and here) Rav Cherlo made the following comments. These need to be considered seriously considering the source. Rav Cherlow gave a 1 1/2 hour talk last night on the chief rabbinate and R Riskin. Rav Cherlow is the head of a hesder yeshiva and very active in medical ethics on several government committees. Enclosed is a brief (from 90 min) summary. The beginning of the end of the chief rabbinate began with the fight between Rav Goren and Rav Ovadya Yosef, which brought the chief rabbinate to an effective stand still and more of a titular position. Today the majority of non-religious Jews have little interest in the rabbinate. The Charedim mainly want to weaken and control the rabbinate but don’t respect it. That leaves only the Dati Leumi (Religious Zionists) who potentially care. I don’t really want to talk about chief rabbis that are being prosecuted. Rabbi David Lau the current Ashkenazi chief rabbi is extremely capable, but won’t take any controversial stand. When asked about pushing for organ transplants he says Rabbi X objects to it. In terms of influence in the country his cousin, Rabbi Benny Lau has a greater presence. Rabbi Riskin is also an inspiration to others (when the radio wants a spokeman or there is a public debate Rabbi Benny Lau or Rav Cherlow are usually chosen). To my surprise Rav Cherlow claims that the largest public religious events in Israel are the various programs on Shavuot night! The chief rabbinate is slowly losing all of its power. Today some 100,000 Non-Jews are Israeli citizens recognised by the Law of Return (chok hashvut) with no hope or interest in converting. In Cyprus the wedding places are all set up for those Israelis who can’t or don’t wish to marry through the rabbinate. This is in addition to all the couples living together without formal marriage. Soon, a minority of couples living together will have been married through the Rabbinate. This obviously means that they also will not be divorced through the rabbinical courts when they separate. Hence, conversion causes less of a problem as they marry elsewhere and being Jewish isn’t important to them. Rav Cherlow brought a story that a brother of the Rav from Ponovezh was intending to marry a non Jewess. A conversion was arranged for the woman within 3 days! According to Israeli law only the rabbinate can give a certificate of kashrut. Presently the various badatzim (Charedi Batei Din) only claim supervision without actually stating that it is kosher. There is a movement of other local groups that will start their own kashrut supervision. There is currently a case in front of the court requesting that any Rabbi be able to give a kashrut certificate. In general many functions of the rabbinate are being taken over by Tzohar which not only performs marriages but also organizes many events for the public. Many of the Dati Leumi Knesset members are in parties other than bayit hayehudi (the Religious Zionist party). Many of them are willing to dissolve the rabbinate as they feel it does more harm than good. An example is Rabbi Shai Piron who is a leading member of Yesh Atid. Others are in the Likud. 2) make the current Rabbinate more inclusive and serving larger elements of the population. Rav Cherlow personally is in favor of the second option. Now, much of Israeli society is traditional. They go through the Rabbinate because it is the accepted way and they have no problems. Once the rabbinate loses its monopoly many of these will choose other options. The rabbinate claims to have problems with R Riskin because he criticises the Rabbinate and doesn’t always follow the rules. 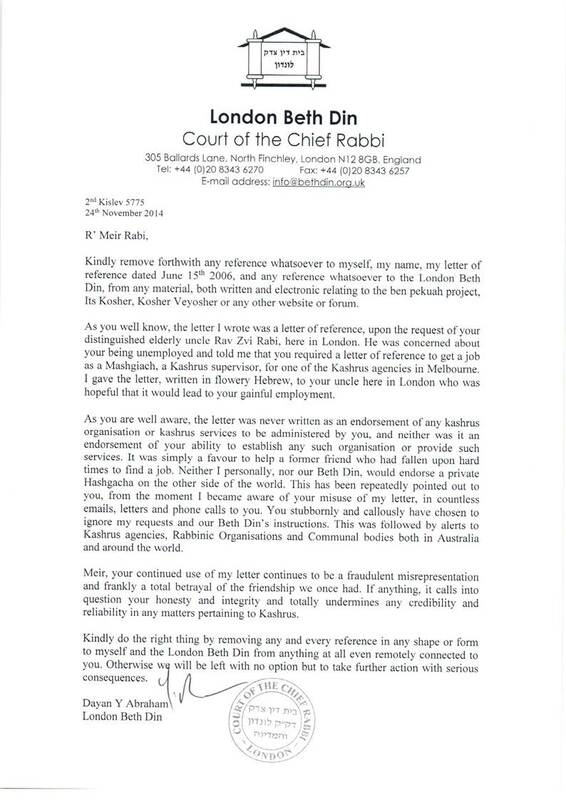 However, many town rabbis from the charedi side do the same thing but are never criticised for their actions. In fact two sets of religious courts have recently released agunot on very controverisal and contradictory reasons. Town rabbis officially have no retirement age – the only government workers with that rule. Recently a law was passed requiring town rabbis to prove they are healthy at the age of 75 to continue. Until now that law was a formality. Rabbi Riskin is the first town rabbi to be called in for a formal hearing! R Cherlow says that he has many disagreements with R. Riskin. However, should the chief rabbinate decide that they have the power to say that an orthodox rule is illegitimate (not just wrong on certain issues) then that is the straw that would force Rav Cherlow to object to the entire establishment. Many town rabbis just collect a salary and don’t do anything. To take a rabbi who is an inspiration to many and throw him out because he is too liberal, is simply too much for Rav Cherlow. Interestingly the chief rabbinate announced that they will not be swayed by public opinion. That itself is a symbol of their problem. What the people of Efrat feel is irrelevant. In the end the Dati Leumi population will vote with the feet and already the other groups have no respect for the rabbinate. That institution will be left with zero support. According to Israeli law only the rabbinate can give a primary certificate of kashrut for products that are sold in israel, and only when a product or an eating place receive a certificate of kashrut from an Israeli official Rabbinate , any private Kashruth organization may add their stamp of their supervision on the kashrut of the product. I can’t see how a court can rule that any Rabbi will be able to issue a kashrut certificate, when the law state clearly, that only the rabinate (chief or local) are permmited to issue kashrut certificates. the only way is to permit any Rabbi to issue a kashrut certificate, is to change the law in the kneset. he is extremely capable to do what? before the the beginning of the Current Shmita year he declared that the rabbinate will not issue kashrut certificate to places that will use fruits and vegtables from growers that use the “heter mechira”, knowing that that the high court rulled that you can’t do it. the chief rabbinate is a useless body, good for nothing, and so is the chief rabbi, the non religious public don’t want them. and they are looked upon by the charedi public doesn’t as rabbnim m’taam, and don’t care about them or their rullings. • [DOC]בג”צ 7120/07 – אסיף ינוב גידולים בע”מ נ’ מועצת הרבנות הראשית ..